Its hard to argue that the technological advancements in dog training over the past 15-20 years has done nothing but help dog trainers advance their dog to new heights. Two products that immediately come to mind are Bird Launchers and Dummy Launchers. When people think of bird launchers they often think about training pointing dogs. Bird launchers have been used for years by pointing dog owners to teach their dogs to “steady to wing and shot”, help develop a staunch point, and even as a correction tool when a dog starts crowding birds. Some trainers even place in a number of bird launchers in a single area to simulate a covey of birds exploding from the brush. This technique helps further develop a staunch point and discourages the natural tendency of pointing dog to “let down” after the flush. While most of these concepts are well understood by pointing dog owners, flushing dog owners have been slowly adopting bird launchers as a tool of their trade. 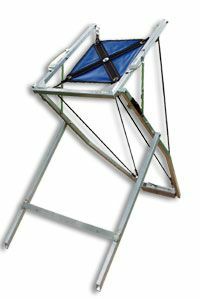 The application of a bird launcher for training can be equally useful to the flushing dog owner. Flushing dog owners often use a bird launcher to assist in lengthening marks for their dogs on both land and water. Bird launchers can also be a great tool to help teach flushing dogs to honor another dog’s flush. When used to encourage honoring you would set the bird launcher ahead and slightly off the course. As the flushing dog approaches the area where the bird launcher is located you would release the live bird and hit the “hup” or “sit” whistle – forcing the dog to honor a wild flush or another dog’s flush. With so many different applications manufacturers are developing two styles of bird launchers: units designed for flushing dogs and those designed for pointing dogs. Units that are designed for flushing dogs are often built to open with considerable force and throw marks for dogs. Innotek and Gunners-Up Box Style Launchers both open with enough force to throw a bumper or pigeon 40-50 feet. While retriever and flushing dog owners find this as an advantage, pointing dog owners should be looking for a unit that opens quietly and “releases the bird” without too much force. Currently, the only brand we sell that is suitable for pointing dog owners is our Dogtra Bird Launchers. Dogtra offers two different sizes of bird launchers; quail and pheasant size. Both units offer the pointing dog trainer a gentle / quiet release of the bird. Advancing a gun dog on marks requires challenging the dog by throwing him a variety of marks at different distances. Often times, I see young dogs only able to retrieve at the distance his / her owner is capable of throwing a bumper. Most owners quickly recognize this issue and turn to a hand-held dummy launcher to increase the distance of the marks thrown for their dogs. The Retriev-R-Trainer™ is our number one selling hand-held dummy launcher. The Retriev-R-Trainer was the first dummy launcher to hit the market years ago, and revolutionized gun dog training by allowing trainers to combine the sound of gunfire with the fall of a bird. Since its introduction, many manufacturers have released similar models. All units use a .22 caliber blank to launch a dummy up to 200 feet. The .22 caliber blanks come it three different loads to allow the trainer to vary the distance of the retrieve - heavy, medium and light loads. The Deluxe Retriev-R-Trainer Kit is available for $122.95, which includes a dummy launcher, 100 rounds of medium loads, two dummies, custom carrying case, and a cleaning kit. One final point, a Retriev-R-Trainer Shoulder Stock is strongly recommended if you are going to be using the launcher with heavy loads. In addition to hand-held dummy launcher, retriever trainers have been using remote dummy launchers and wingers for years. 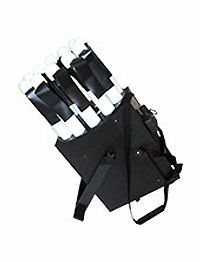 Remote dummy launchers and wingers are considered a must for the gundog enthusiast interested in competing hunting tests or field trails. These devices are designed to simulate the flight and fall a game bird and capable of throwing a training dummy or bird up to 45 yards with pin-point accuracy -- allowing the trainer to reliably simulate complex concepts for their retrievers. With these dummy launchers the retriever can see the arc of the fall from the line. Most remote dummy launchers also offer the trainer the ability to launch up to 12 training dummies before reloading – a huge advantage to the person who trains multiple dogs alone. There are two primary leaders in the remote dummy launcher industry: Etch Marc and Bumper Boy. 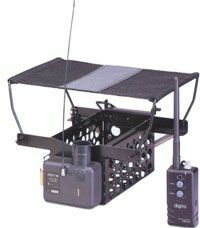 Etch Marc Thunder Bird Launchers are extremely popular among professional field trailers as they are extremely easy to set up and can be equipped with either the Tri-tronics Pro Control Release System or the Dogtra Remote Release System. The Etch Marc Thunder Bird uses propane to launch the bumper and simulate the sound of a shotgun. The Thunder Bird can be purchased in systems capable of shooting 4, 8 or 12 dummies before needing to be reloaded. The Bumper Boy system uses a proprietary release system and can not be interchanged with other accessories. Bumper Boy uses light, medium or heavy .22 caliber blank to propel the dummy into the air and comes in a 2,4, 8, 12 unit system. Wingers are different from remote dummy launchers in a two major ways; first they are only capable of a single launch before needing to be reloaded. Secondly, they can throw both live and dead birds with ease. The fact that these devices are capable of throwing birds often overcomes the single throw limitation for folks looking to prepare for field trials or hunting tests. We carry two different types of wingers; Gunners Up and Zinger Winger Launchers. Both wingers utilize a similar design and are capable of throwing a duck 25 yard in a perfect arc. Both Gunners Up and Zinger Winger can be equipped with either Dogtra or Tri-Tronics remote release systems.